Hamburg, 14th February 2013 – The past decades have seen the popular classic Mahjong lose none of its attraction, and with its simple playing concept it still appeals to all age groups, just as it always has. However, all too often the enjoyment has been dulled by less than clear graphics and monotonous puzzles. That changes with “Mahjong 3D”. With this Nintendo 3DS title, the successful Chinese board game appears in the Nintendo eShop now and can be easily downloaded onto consoles. Those days of numerous bits of packaging lying around the house or taking up unnecessary space in your luggage are gone, consigned to the past. The new three dimensional presentation lets the tiles be viewed from different perspectives, making them particularly easy to see all over. The boards themselves will enchant with their beautiful backgrounds depicting stone temples, green landscapes or imposing Buddhas. Together with its impressive sense of depth, the game really does make the ancient empire come to life in all its glory. The game contains more than 180 puzzles with a richly varied background story which takes the player back to a time of feuding Chinese provinces headed by mighty warlords. In the three playing modes Battle, Duel and Build, skilfully vanquish your opponents using fast paced moves, acquire allies and rebuild your country’s temples. The plentiful short puzzles make the game an ideal recreation for those in between moments, because you’ll always have time for a quick puzzle session. No matter if you’re on the bus, on your lunch break, or just waiting for your friends. And once you meet up you can then use the StreetPass™ function to exchange new levels with them that you have created previously using the integrated level editor. Endless playing enjoyment is guaranteed. 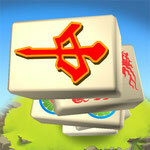 From now on the Nintendo 3DS game “Mahjong 3D” will be available in the Nintendo eShop, priced at 19,99 €. In order to enter the virtual market place, players can find a local ‘Access Point’ in ‘Game Settings’ and then use it to establish an Internet connection. And then the shopping fun can begin. Cool special effects in real 3D: The titles are really jumping out at you!